Cloves have a Latin name Syzyglum aromaticum. Its healing properties have been mentioned since ancient times in the old writings of the Indian Ayurveda and traditional Chinese medicine, but also a little later in the seventh century it was also mentioned by the west phytotherapists and healers, as it was appreciated as a good fighter against the plague, which at that time swept across Europe. The plant grows only in tropical (sea) climate, but today it is massively grown in Indonesia, Madagascar, Malaysia, Brazil, Zanzibar and Sri Lanka, but thanks to the skilful medieval merchants, who saw in it a chance for a good profit, brought it to other areas. This extraordinary natural antioxidant, is an excellent analgesic and antiseptic, especially appreciated in Phytotherapy. How to take advantage of all the benefits of cloves as a spice in preparing your favourite dishes, and how to use clove as medication against bacteria, viruses and fungal infections, find out below. Clove is a medium-high, delicate, evergreen tree in tropics. It belongs to the family of myrtle (Mirtaceae). It has an interesting tree in the shape of a pyramid and large, leathery, egg-shaped leaves which always occur in pairs. The leaves are very aromatic and have a pleasant smell and its branches, are small red bell-shaped flowers, which appear in dense groups, in two periods during the growing season. The characteristic smell of cloves can mask the odours of other foods, and that is why it was used in the past, as well as for its distinctive, slightly sharper flavour, but also for the treatment of various ailments. While pink flower buds are there, cloves are picked by hand or with the help of shaking sticks of bamboo, and then dried in the sun. Drying changes the colour into brown, after which the clove are recognizable. They are 12-16 mm long and resemble small pegs (lat. Language called Clavus, and that means a nail). Stems end with prominent flower buds that are composed out of four parts. Their scent is warm, slightly pungent and aromatic, but the taste might be described as sweet and at the same time very strong. Cloves (buds) are put into a glass filled with water and look if they float vertically. If so it is a good product that you can use, if they sink to the bottom, or move horizontally, then do not use them. Although the cloves are most known and appreciated in cooking, as a delicious and aromatic spice, it also has a lot of healing properties. Traditional Chinese folk healers have used cloves as a medicine since ancient times primarily for the treatment of disorders with digestion, against diarrhoea, vomiting (hernia), lichen on the skin, athlete's foot and other fungal infections. In medicinal purposes mostly used are flower buds. The amazing properties of cloves have long been known to doctors and phytotherapists worldwide. Cloves contain medicinal substances (eugenol, caryophyllene and tannins) whose antimicrobial properties successfully kills the tiny parasites, wherever they are in the body. It is an essential ingredient in antiparasitic program of Dr. Clark, where with the tincture of black walnut and dust of wild wormwood, he destroyed the eggs that live in the body. Its moderate consumption prevents the emergence of a whole range of modern diseases, both internal and external, will strengthen the immunity but if you drink tea made of cloves, it will facilitate your digestion, but dose it in small quantities to avoid counterfeits. 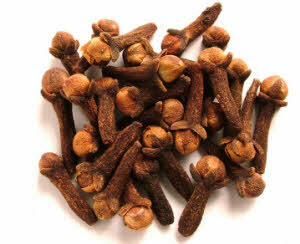 Cloves are very rich in precious minerals such as iron, zinc, manganese, copper, magnesium, selenium and calcium. When it comes to vitamins B6 is present, unavoidable C, K and E vitamins and it is also rich in niacin, thiamine and riboflavin. A great choice for every day is a freshly ground clove powder, or the use of the concentrated state for soaking essential oil with water is great. Essential oils of clove are probably the best product of this plant, which we can make by grinding the cloves just before the preparation, otherwise, its medicinal substances evaporate and lose its healing power. It's considered a good fighter against persistent candida fungus that knows how to make a real fuss in our intestines, and to spread throughout the body, it also eliminates a whole range of bacteria ranging from staphylococci, pneumococci and streptococci. Cloves as a medicine is sufficient by itself, if we use it every day with our favourite dishes and add it as a condiment, which is characteristic of Ayurveda, where besides cloves, turmeric is used a lot. Pour into a jar a quarter cup of clove buds, then pour them with quality olive oil (1 full cup). Close, hang and allow it to rest for 24 hours. After a day strain the resulting oil, transfer it to a suitable glass jar with a strong lid, and leave it to cool in the fridge. Always keep it closed. The essential oil of clove (a few drops) add it to the water and gently mix and you will get a remarkable natural remedy for nausea, which will at the same time reduce the urge to vomit and completely stop it. This drink is especially useful during the summer period, when the aforementioned problems occur because of high temperatures. The same recipe can be used to clean your body of unwanted parasites, and many bacteria, but it can also be used externally to mitigate the effects of burns because it will effectively prevent the occurrence of infections on the skin surface, while at the same time it will ease the pain, if it is applied and rubbed in. Rinse the mouth with a little diluted oil of cloves or chew the buds of the plants if you suffer from a chronic sore throat and you have frequent sore throats. Cloves as a medicine in this way alleviate the inflammation of mucous membranes in the mouth and pharynx and has the positive effects that will take effect quickly after its consumption. Also you can find clove oil in many shopping preparations together with long herbs which are effective at rinsing the mouth and relieve bad breath. Also, this method will not allow decay to aggressively expand, and if you suffer from toothache this home remedy will surely help you. Put five grams of clove buds in a glass bottle with water and place in refrigerator for 24-48 hours. Periodically during the day, check on your bottle a couple of times to shake the content. After the third day you can start taking it every morning at a dose of one small cup of coffee (about a decilitre per day). When you spend your first amount of the domestic drug, feel free to make the next round. After the second bottle take a break of thirty days, to relax your body. Cloves as a drug can be taken again after one month, if there is need. The best practice is that before taking the drug you do a detailed blood count examination, and to repeat it after the treatment, to determine what are the values ​​of cholesterol and triglycerides. Experiences with cloves are very good and that after drinking the 'first tour of the drink there is no need to make a new one. Our advice and recommendation is to first talk to your doctor, especially if you are already on therapy, or taking certain medications. Mix thirty grams of cloves, cinnamon and ginger powder and place it in a dark place. Every morning before breakfast a tablespoon of the mixture dilute in 1-2 dl of water and drink it right away, on an empty stomach. Apply therapy up to thirty days, after which you take a break..
What characterizes the cloves as a medicine is the very effect on the digestive tract, along with it, the food is better, and easier to digest, immunity is stronger, circulation is better, no bloating, heartburn, nausea and other unpleasant digestive symptoms. With cinnamon and ginger its effects further enhance, and is especially useful for those who are planning to remove excess fat around the waist, which is certainly possible with the daily exercises for the stomach. Results will not fail and fat will disappear, if you are persistent. Cloves are very effective for digestive problems and stool. It will help relax the muscles of the digestive tract, which will encourage better digestion and metabolism will speed up. If you suffer from constipation, you should think about it using cloves. Since it slows blood clotting, special caution should be taken by people diagnosed with haemophilia A or B, especially the more severe forms that are accompanied by spontaneous bleeding into the joints (usually knees). Also, people with a chronic disease of the liver and kidneys, diabetic, patients with lupus and prostate cancer, should avoid clove. If you do not have the aforementioned diagnosis, but take aspirin, ibuprofen, heparin or another anticoagulant daily, do not use it. Side effects can occur if you apply clove oil directly on the skin, if you have a sensitive skin. Then redness, irritation and even allergies can occur, and a general recommendation is to avoid it. If you can dilute it with another oil, and these problems will not occur. Cloves during pregnancy should not be used because they are not fully tested. During breast-feeding do not take it also, but it is recommended not to give it to small children also, because it can cause stomach problems and indigestion, liver problems and even loss of balance. Pour two to three buds of cloves with two and a half decilitres of boiled water. Cover the top and let it stand for at least fifteen to twenty minutes. Strain the resulting tea and drink up to three times every 24 hours. Pharmacists recommend combining this tea with two capsules of clove powder twice a day. You will get a good aphrodisiac, which is not harmful. Because of its good smell, clove plant is always applied in cosmetics, especially in making perfumes. Even in the 16th century it was highly sought after and popular, because of the famous fragrant combinations to which were added avandia, musk and ambergris. It was one of the ingredients used in the mixture which filled the protective masks of doctors, who were moving among the patients with fever during epidemics. What makes it today particularly appreciated is its scent, which is an indispensable contribution to the smell of many of today's perfumes. Cloves as a drug are effective in destroying intestine worms, also relieve toothache, and act as a repellent and an insecticide, it is particularly effective against annoying mosquitoes. Clove oil is now relatively easy to find in better-equipped herbal pharmacies, shops with spices, etc..